This is wonderful. Do you sell your jewelry? Yes, some of them. Still got all talismans. Which one would you like? What does it mean? I mean, what are its magical attributes? The main property is 'secret of the Dragon'. 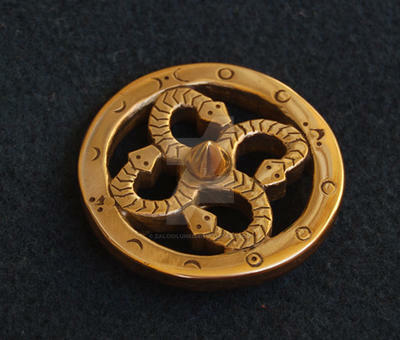 It consists of 4 powers symbolised inside this brooch. 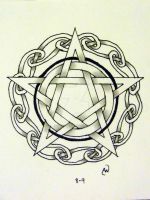 Perceiving these 4 powers you gain the secret of the dragon and also these 4 great powers of nature. Wow, beautiful! Even though I read that it's brass, I still think it's wood when I look at it! Wow... how did you make this? I really like the "phases of the moon" detailing around the border! Very nice - I like pieces that look ancient.